Whether it’s sipping a beer as you float down a river or getting a cold pint after a long day on the trails, the breweries here honor and exemplify the adventure seekers that support and sustain them. Whether you’re looking for a flowing cascade or an impressive chute, a drive-by photo opp or a strenuous all-day hike, the Smokies have something for you. Throw on your most comfortable pair of Chacos, pack your backpack with breathable clothes and sunscreen, stock up on water, and head to a music festival (or all eight, we won’t judge) for an unbeatable time in the great outdoors. 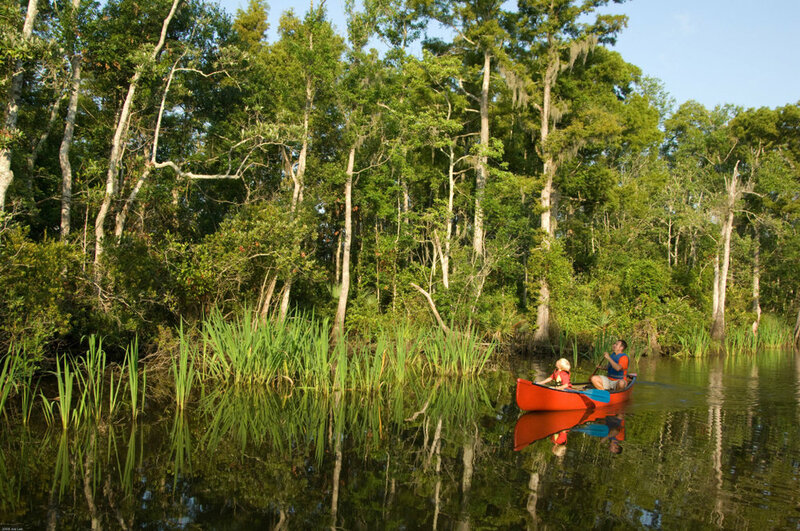 With so many options, mild year-round temperatures, and generous annual rainfall, the South is a coveted destination for paddlers of all abilities and passions. At Buffalo Peak Outfitters we work every day to bring our customers the best equipment and apparel the industry has to offer. Our goal is to provide an enjoyable one stop shopping experience for your next adventure. Whether you’re traveling across the world, staying in your favorite weekend cabin, or conquering Mt. Kilimanjaro, we’ve got you covered on gear, luggage, clothing, and accessories. Our buyers have worked hard to bring our customers all of these products and we have compiled a list of some of our staff favorites for this spring/summer season. First up is our favorite pack. Osprey’s new Aether/Ariel series of packs has everything you could ask for in a large internal frame backpack. Osprey continues to be on the cutting edge of pack design with this updated series. They have kept the same highly efficient frame for those heavy loads, added their beloved AG harness system, and even added a lid that transforms into a full day pack. The Aether/Ariel series of packs comes in 60, 70, and 85 Liter capacities (55,65, and 75 for women) and is perfect for any adventure from trail to travel. Once you’ve got your pack you’ll need a good pair of boots and socks. We have a wide selection of both, and the Oboz Bridger is one of our favorites. The Bridger is an extremely capable boot. It has a full leather upper for durability, aggressive outsole for excellent traction, and with its roomy toe box and lacing all the way through the ankle, it offers a comfortable, yet secure feel. This boot is perfect for everything from short day hikes, to multiday trips. Pair these with an all American made, high quality merino wool sock from Farm to Feet and you’re ready to hit the trail. Next up is a shelter. Tents can be a difficult purchase. There are many great options out there, and even more that will leave you cold and wet if a good rain blows in. When looking for a good tent you want something durable, light weight and above all water proof. The MSR Hubba Hubba NX fits the bill and has been a beloved tent by many for some time now. At 43 cubic feet of space weighing in at just under 4 pounds, the Hubba Hubba NX is the perfect two-man tent for almost any situation. Now that you’re guaranteed to stay dry you’ll want to stay warm. A good 25 degree bag is an optimal temperature rating for our southern climate and can easily be stretched into much cooler climates. The Big Agnes Boot Jack 25 is an excellent option for someone who wants a high quality true down bag, but doesn’t want to spend $300 on one. Priced just under $200 the Boot Jack is for any hiker who is serious about staying light and warm, regardless of experience. A water filter is another necessary piece of equipment for any hiker. A good filter can make the difference between a miserable ending to a trip, or a successful hike. This brings us to the Trailshot. The TrailShot is a compact, pump style water filter. It has all the benefit of any pump filter on the market, but at half the price and less than half the weight, yet still maintains a flowrate of a liter every minute. The TrailShot is a must have for any weight conscious hiker. Last on our favorites list is clothing. In the outdoors world wicking materials are the only way to go. Patagonia’s Capilene is at the top of that list. Capilene is the perfect synthetic active wear for any adventure. With its wicking ability, anti-microbial traits, and variety of thicknesses and weights Capilene is the ultimate in everything from t-shirts to thermal base layers.